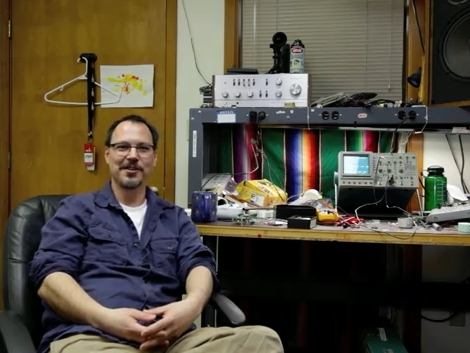 This is [Pete Dokter], the fourth employee that Sparkfun ever had and currently Director of Engineering there. As you can see, they’re not letting [Peter] come out of his hole. Instead of designing new breakout boards they’ve given him a camera that he’ll be using to record his occasional pontifications. ‘According to Pete’ will become a regularly occuring online show where he answers questions from around the Internets. We’ll admit that the first episode, embedded after the break, is a bit content thin – serving only as an introduction. But we think [Pete] has a pleasant manner and we look forward to what blossoms out of this modest beginning. We’ve long been fans of engineering-oriented online shows such as [Dave Jones’] EEVBlog, [Bill Hammack’s] The Engineer Guy, A collaboration between [Chris Gammell, Dave Jones, and Jeff Keyzer] call The Amp Hour, [Jeri Ellsworth’s] A-Z Videos and her upcoming series, [Ben Heck’s] The Ben Heck Show…. and we could go on. With offerings like these you don’t need to wait for traditional TV to transition to IP delivery. Just stop watching crap and start watching these interesting shows. Once a month? Seriously? This show had better be 4 hours long each time then. I don’t know why, but I’m not really excited about it in any way shape or form. I enjoy the EEV Blog quite a bit, so I’ll give this one a go. See ya next time, Pete!